In recent times, the Federal Government of Nigeria has been struggling to contain her 8.6 million out-of-school children (high figure in the world) through various interventions. One of such interventions is the National Home Grown School Feeding Program (NHGSFP) which seeks to provide at least one very good meal per day, to the pupils. Cheerlessly, due to obvious reasons, insecurity, in the country, experts contend that the figure at 8.6 million is highly conservative. For example, in Benue State, North-Central Nigeria, irked by the worsening humanitarian crisis occasioned by incessant farmers-herdsmen clashes, Governor Samuel Ortom announced that 70 per cent out of the over 170,000 internally displaced persons in Benue are children. He didn’t stop there. He alarmed that these children no longer have access to functional education. In a related development in Nasarawa State (yet in the North-Central geopolitical zone), it is recently reported that 20,000 pupils have been forced to abandon school over herdsmen crisis. I purposely de-selected examples from the other five (5) geopolitical zones especially Northeast Nigeria where Boko Haram is proving stubborn against the armed forces, to highlight that our educational deficiency is widespread and endemic. Northeast has suffered a major setback in education and other dimensions of development on the account of Boko Haram which mounted a brazen campaign against Western education and later transformed to a terrorist network. Notwithstanding, every state have their own share of the problem. This has summed up to a measure of full-scale educational crisis at the national level. The essence of Day of the African Child (commemorated on June 16, every year) is to honour hundreds of school children who were brutally mowed down by the Republic of South Africa. In 1976, school children had risen against a dysfunctional educational system in their country; demanding reforms and increased funding. What followed was a joint misbehaviour from the government and security agencies. Instead of heeding to calls for reforms which were dire (as we have in Nigeria today), the government resorted to violence – killing hundreds of school children who were “merely” exercising their fundamental human rights by calling on their government to reform for global competitiveness. Consequently, on 16th June 1991, the then Organisation of African Unity (OAU), now African Union (AU) declared June 16 as Day of the African Child. It became a day for Member States to reconsider national educational policies and more comprehensively, commitments to the attainment of the sustainable development goals (SDGs). The theme for 2018 is: Leave No Child Behind in Africa’s Development. As a continent, how have we fared on matters of child protection; basic education; universal health coverage; etc. Africa must move beyond the fanfare of June 16 and pursue social and economic development with every vigour and rigour. Africa is not lame! Nigeria cannot conveniently shy away from the problem. Without minding that Nigeria’s population explosion has put pressure on the country’s resources; public services and infrastructure, I maintain “there is no way to run”. A possible consequence of our dysfunctional education is best captured when the President of the Senate – Senator (Dr.) Abubakar Bukola Saraki warned that the situation is not only alarming but also a ticking time bomb. How else can I describe this dangerous situation to sound more convincing? The above security perspective by Senator Saraki cannot be digested in isolation. What about the ability to secure jobs or employment that can guarantee sustainable livelihoods. In the science of genetics, organisms reproduce after their kind. The same is true of poverty. One big reap in education is the opportunity to acquire suitable skills for contemporary jobs. Google recently established an artificial intelligence (AI) centre in Ghana. As organisms, we either evolve and adapt to survive or we perish. This is a long standing scientific fact. There are even more convincing instances on why Nigeria must invest in her people – human capital development. National and international economic environment is quite dynamic or rapidly changing. Should the “giant of Africa” be left behind? CODE and other CSOs in Press Conference, calling for #AmendUBEAct in Abuja. 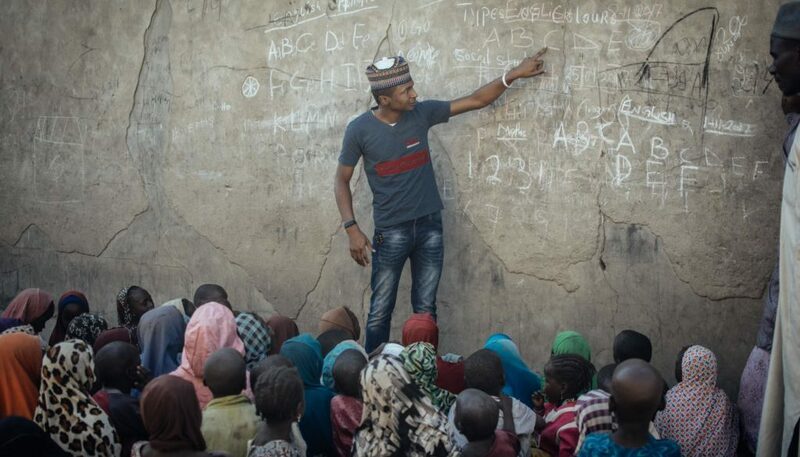 In its traditional innovative solutions; synergy with Nigerian CSOs and in partnership with Malala Fund, Connected Development is currently leading a campaign on the urgency to amend the country’s Universal Basic Education (UBE) Act of 2004 to accommodate contemporary discrepancies and realities. For emphasis (at the risk of sounding trite), one “miraculous” way that the Federal Government of Nigeria can respond to the frightful of out-of-school figure is to amend the current UBE Act (please, track previous national conversations on twitter using #AmendUBEAct). As I excuse my keypad for other itineraries of the day, let me conclude with a few sentences. As far as governments (at all levels) continue to keep mum over our 8.6 million out-of-school children, excruciating poverty is inevitable. Whereas it is no longer fashionable to abandon the business of governance to governments alone; citizens must support government officials in all possible ways for I consider bad leadership and poverty as our “common enemy”. By the way, my heart goes out to hundred of children in the Republic of South Africa that were murdered, gruesomely, on this day 1976. For this is the 28th edition of the #DayOfTheAfricanChild which you paid the supreme price, making it to be. Written by Ani, Nwachukwu Agwu. Ani is a rural development practitioner. He can be reached via Nwachukwu@connecteddevelopment.org . He works with Follow The Money – the fastest growing social accountability movement in Africa.